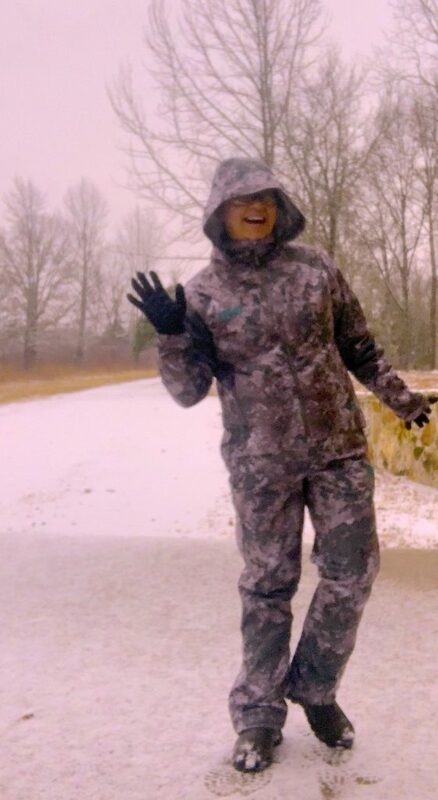 I recently purchased the Girls with Guns Clothing rain wear jacket and pants. Designed by the team of Jen O’Hara and Norissa Harman (founders of GWG Clothing), the set comes in a new camo pattern called “Shade,” which is subtle and attractive. I decided to put it to the test when Winter Storm Petra arrived outside my door in the Ozarks last week. First, as soon as I received the jacket and pants, I tried them on. The set runs a bit bigger and GWG Clothing claims it will fit over its line of hunting jackets and pants. Now, that makes sense. You can either wear your field wear, their line, or base layers under this dynamic duo. Next, I washed the apparel in cold water, on the delicate cycle. It’s made of 100% polyester. Then, I washed it in super-hot water. I forgot that I’d left these clothes in the washing machine from the day before and dumped bleach into the dispenser, and a full load of white sheets and clothes into the machine (yes, on top of the GWG clothes). So, I bleached and ran that outfit through the wringer – even though, technically, I have a non-agitator type washing machine from South Korea that sings to me and came with a DVD so that I could learn how to operate it. I felt agitated when I discovered that I’d left this $300 set of outdoor apparel in the washing machine and had probably ruined it. But no, I didn’t ruin it and hung it up to dry. In fact, the bleach didn’t even take the sheen or color out of the fabric. Hmmm. Now, I’m wondering, does the dispenser work? Seriously, I had not had an opportunity to review the rain wear until this week, and even though I wasn’t out hunting or bird watching – which would be another excellent use for this gear, or maybe even winter fishing in this outfit — I decided to walk the half mile to and from our rural mailbox in heavy-falling snow and then, sleet, while Petra blew through our neck of the Ozarks woods. Let’s take apart the rain jacket first. GWG Clothing claims it’s 100% waterproof. It comes with a 10,000/10,000 waterproof breathability rating. What in the wide world of the outdoors is that? Thanks to Evo, here’s a breakdown of waterproof ratings. This rating places the suit into the “rainproof and waterproof under light conditions” category. What do the numbers mean? Manufacturers typically describe the waterproof breathability of fabrics using two numbers. The first is in millimeters (mm) and is a measure of how waterproof a fabric is. In the case of a 10k or 10,000 mm fabric, if you put a square tube with inner dimensions of 1” x 1” over a piece of said fabric, you could fill it with water to a height of 10,000 mm (32.8 feet) before water would begin to leak through. The higher the number, the more waterproof the fabric. The second number is a measure of how breathable the fabric is, and is normally expressed in terms of how many grams (g) of water vapor can pass through a square meter (m2) of the fabric from the inside to the outside in a 24-hour period. In the case of a 20k (20,000 g) fabric, this would be 20,000 grams. The larger the number, the more breathable the fabric. Things I like about the rain jacket. What I like about the rain pants. Same thing going on here. Waterproof claim is 100% and same breathability rating, and 3L bonded fabric with fully taped seams. GWG Clothing’s design of adjustable inseams. Just snap up the pants to adjust to 34-, 32- or 30-inch inseams. At full length, the pants will be 36-inches, which is great for tall women. After about an inch of snow piled on top of my hood and I knocked it off, Mother Nature decided to throw some sleet at me. I’m surprised she didn’t opt for golf-ball-size hail instead. The suit warded off the side-sleet whipping in at about 20 miles per hour. Here’s a little bonus. I dug around in my outdoor drawer and found my trusty GWG Clothing ponytail beanie and popped that on my head and drew my power pony out the back. I often will wear this little number to town with my wax jacket, just for a lifestyle statement. Also offered in the Shade pattern, it comes with fleece-lined ear flaps and it’s not a small beanie. This one should cover above-average brain power, if you know what I mean. In fact, one reviewer said she layers it over her duck hunting ball cap. That’s a perfect idea. I am also a huge fan of the teal accents going on with this entire line of hunting apparel from GWG Clothing. Totally crushes the UA pink and orange effects. Even though my thighs don’t rub together, the extra fabric around the knees would brush together and it sounded like an elephant wearing pantyhose. But then again, if it’s raining and you’re moving, will wildlife hear this noise? When I moved my arms, I didn’t hear noises, just from my knee area. And, no, I haven’t noticed a weight gain there. Reprinted with permission by Women’s Outdoor News. 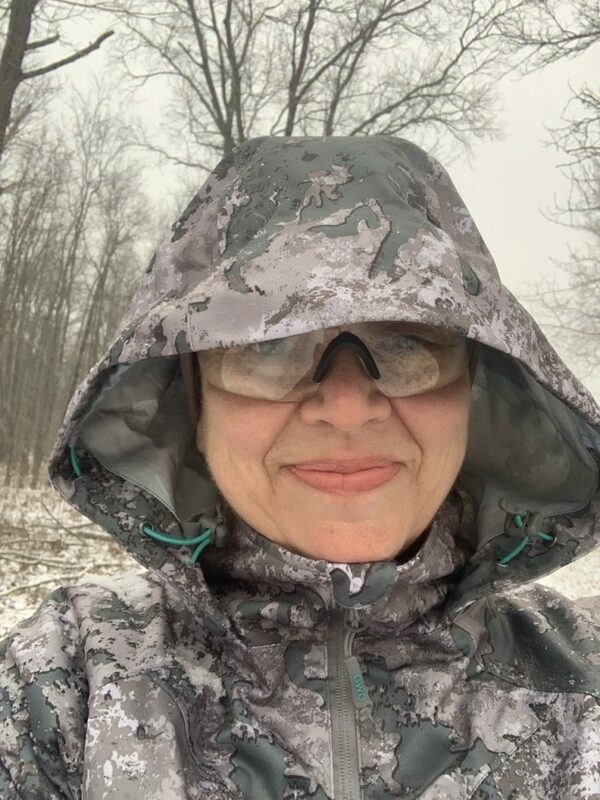 Publisher/Editor Barbara Baird is a freelance writer in hunting, shooting and outdoor markets. She is a contributing editor at “SHOT Business,” and her bylines are found at several top hunting and shooting publications. She also is a travel writer, and you can follow her at ozarkian.com.